On Tuesday October 30, we will have a noon meeting. Diana Broderson will be presenting on Prevent Child Abuse Iowa activities in Muscatine County. A Subway sandwich will be lunch for our program presenter on Tuesday. If you’d like to have a sub sandwich please email Tommie Petersen what flavor of sub (including white or wheat) no later than Monday October 29 at 5pm. Members pay for their own Sub. Tommie will have subs picked up and deliver to the CC. 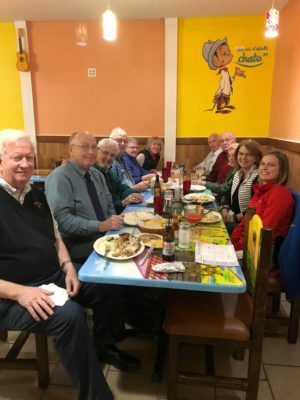 On October 23, Rotarians meet at El Patio restaurant at 5:30 p.m. for a social evening. Food was very tasty while enjoying everyone’s company as well as a rousing finale song by our long-time members of the club. our Annual Meeting being held on Tuesday Nov 13th at 6pm. All members will vote for two Directors of the Board that are coming due for the 2019-2020 years. 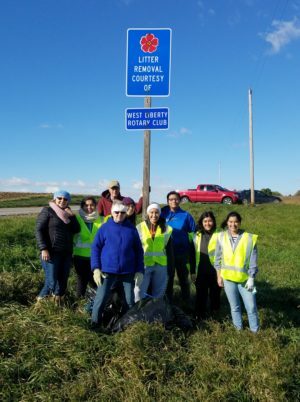 Rotarians did their bi-annual cleanup of our two-mile stretch of Highway 6 on Saturday, October 20. There were 6 Interact students who joined Bob Cline, Marian Hart, Anna Hanson and Steve Hanson. Thank you to all who came out to enjoy the fun this am in keeping the community clean! 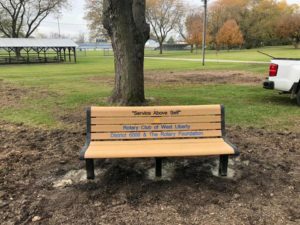 Small update for the Kimberly Park playground from last week is that the Rotary bench is up and installed now as well thanks to the West Liberty Park and Rec Department and City of West Liberty. 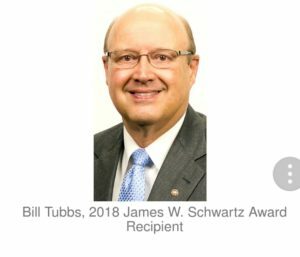 Past District Governor, North Scott Rotarian and District 6000 publicist, Bill Tubbs has received the James W. Schwartz Award from Iowa State School of Journalism. 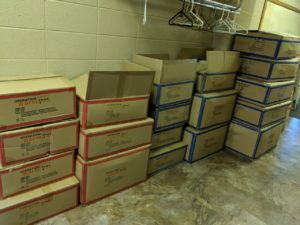 Cases of coats came in this past week for our club’s donation to Operation Warm. Marian Hart will be sharing more details soon so stay tuned! The Rotary Foundation annual dinner will be held on Saturday, November 3 at the Sheraton hotel in West Des Moines. The cost is $50; here is a link to the registration form: Rotary Foundation Dinner. Carl Chinnery, a polio survivor and PDG District 6040, will be the featured speaker. All Rotarians are invited. We hope various members of our club will consider attending this fun event! One new Wild Polio case reported this week. See attached report. World Polio Day will be celebrated this coming week (October 24). Click here to see a video from RI President Barry Rassin about the Celebrations of World Polio Day https://www.youtube.com/watch?v=mk85QQy4GB0&feature=youtu.be See the endpolio.org site for the 5:30 – 6:30 PM (Central Time Zone) Live-Stream and to register your Club’s World Polio Day event and to see the world-wide map of registered WPD Events ! Many Polio fundraisers are in the works for the World Polio Day (and month) time frame – including Foundation Recognition Matches, Live-Stream Watching Parties, Pints & Pino for Polio events, an End Polio Ragball Tournament, Galas and more. Talk It Up! 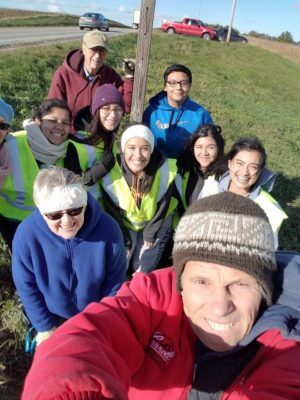 – Some Rotary Districts and Clubs rarely speak about Polio Eradication – thinking it’s too big a project for them to have an impact on or being exhausted from the over 35 years we have worked on the giant effort. But we must continue our efforts. Remind everyone that only $.60 protects a child with a dose of the Polio Vaccine. And remind them of the unthinkable consequences of not finishing the job – a return to the days of thousands of children paralyzed by Polio each year. What is that Polio Eradication Picture? World Polio Day 2018! this coming week! Zero is the Magic Number! The three year Countdown to History starts after the final Wild Polio case. Today, we restart the count since the report of the most recent Wild Polio case. 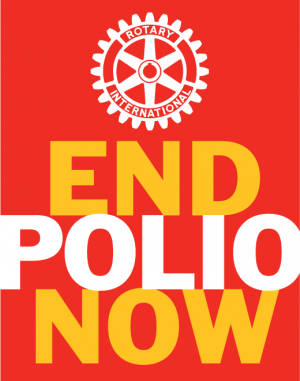 · Rotary is committed to raise $50 Million (including Rotarian, public, and DDF donations) to be matched by $100 mil from the Gates Foundation – for each of the next two years – for a total of $300 million for the Global Polio Eradication effort. · Papua New Guinea, Kenya, SYRIA, SOMALIA, Niger, Nigeria & DRC – Vaccine Derived Polio Casesreported in 2018: Papua New Guinea – Eighteen cases (Three new cases this week), Nigeria – Twelve cases (Two new cases this week), Niger – Six cases (Three new cases reported this week), Somalia – Thirteen cases (One new case this week), DRC – 15 cases (No new cases this week). Ninety-six Vaccine derived Polio cases were reported in 2017. § Pakistan – No new Polio cases reported this week. Four Polio cases reported in 2018 – the most recent case was from Sarki Tetara District, Charsada Province with an onset of paralysis on 8/01/18. Eight cases reported in 2017. Two new Polio-Positive Environmental Samples were reported this week in Pakistan. § new Polio case reported this week. Sixteen Polio cases reported in 2018 – the most recent case was from the Hilmand Province with the onset of paralysis on 09/01/18. Fourteen cases reported in 2017. Five new Polio-Positive Environmental Samples were reported this week in Afghanistan. § Nigeria – No Wild Polio cases have been reported in 2017 or 2018. The most recent Polio case was reported on 8/20/16. On 8/20/18, Nigeria celebrated 2 years without a Wild Polio case! Our Goal is Global Polio Eradication!! Oct 30 Noon meeting. Diana Broderson presenting on Prevent Child Abuse Iowa activities in Muscatine County. Ethan Anderson leading meeting. Nov 6 Ranger Keith Hindman will make a presentation about national parks, with a focus on the Herbert Hoover historic site. Nov 13 ANNUAL MEETING followed by Board meeting. Nov 20 No meeting due to Thanksgiving holiday. Nov 27 Noon meeting. Dana Nelson will arrange program; Steve H. will lead meeting. Dec 4 Jennifer Blair (past Rotary Ambassador) and Jim Peterson present about Tanzania water project. Dec 9 2pm Cocoa & Carols at WLHS. Each Rotarian provides 2 dozen cookies or contributes $10 for cookies and punch. Pay Jodi Kelly and/or if you have questions, contact Marian Mart. Dec 12 Pack food into Christmas boxes on Wed. Dec. 12th at First Church United at 6pm. Dec 14 5:30pm – 8pm Assist with carrying Christmas boxes to vehicles. Bring 2 wheel carts. First Church United. Dec 15 8am – 10am Assist with carrying Christmas boxes to vehicles. Meet at First Church United.